Body movement can help blood circulate more freely around the body and a workout with a fitness hoop can improve circulation of blood around the body. 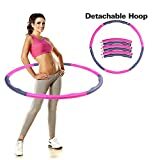 These pro hula hoops are ideal for exercise, fitness, dance or just pure fun, whether that is in a park, jym, school or festival! Great for kids & adults of any level of skill! Our Fit Pop Hula Hoop will make your exercise a fun, everyday activity that you will look forward to. Its collapsible, lightweight, 8-part design that is easy to carry with you anywhere means that you don’t have to push yourself into going to a gym. Save money!